Stainless Steel-Polished and Satin Finish. 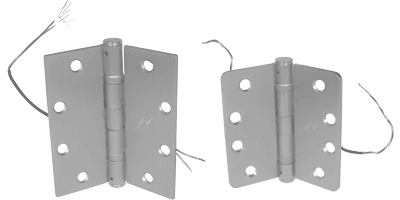 •Electric hinges allow electrical currents and signals to pass from jamb through the hinge into the door in an invisible manner. To order use symbol “EL” as suffix. EL2 Wire Concealed electric through-wire. EL2+4 Wire Concealed electric through-wire. EL4 Wire Concealed electric through-wire. EL6 Wire Concealed electric through-wire. EL8 Wire Concealed electric through-wire. EL10 Wire Concealed electric through-wire. Additional wire length may be purchased at additional cost. See pricebook for additional cost. All electric hinge modifications are to be placed in the center hinge position. Any other locations will void warranty. For grout filled frames install PBB mortar box-Failure to install mortar box voids warranty.